An adjustable suspension sleep device is provided to suspend an individual while sleeping. The adjustable suspension sleep device has a body support assembly having a first and second longitudinally extending sides spaced apart by first and second ends. A first adjustable tensioning assembly is in communication with the first side of the body support assembly and a second adjustable tensioning assembly is in communication with the second side of the body support assembly. Further, a first suspension support assembly is in communication with the first end of the body support assembly and a second suspension support assembly in communication with the second end of the body support assembly. The first and second adjustable tensioning assemblies each include a tension adjustment device. A method of use for the adjustable suspension sleep device is also disclosed. the Nap-Sac’s compact, lightweight design makes it easy to take along, whether you’re traveling on four wheels or two; or even your own two feet. 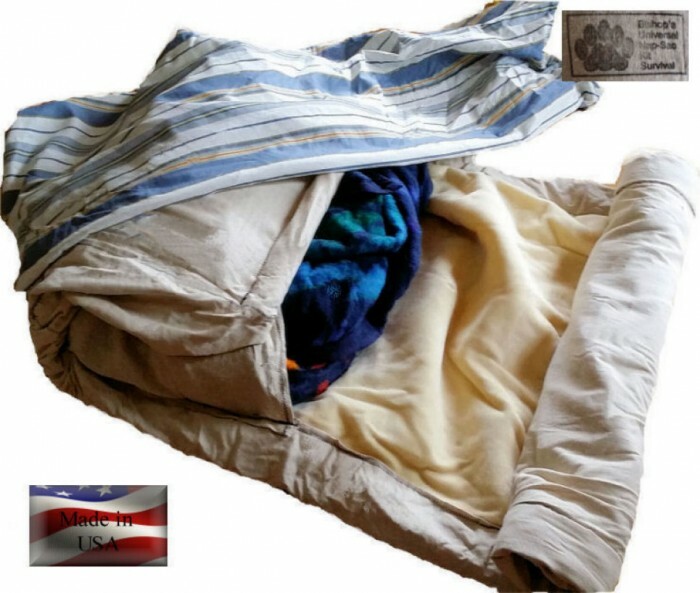 Without blankets, the Nap-Sac is still a compact 6″ X 6″ X 16″ and approximately 4 pounds. With two warm blankets, the Nap-Sac is still a compact 10″ X 10″ X 26″ and approximately 8 pounds. Add a small tarp and additional rope for a rain fly and you’re ready to enjoy your next motorcycle, bicycle, canoeing or camping trip and save money from not having to buy hotel rooms. 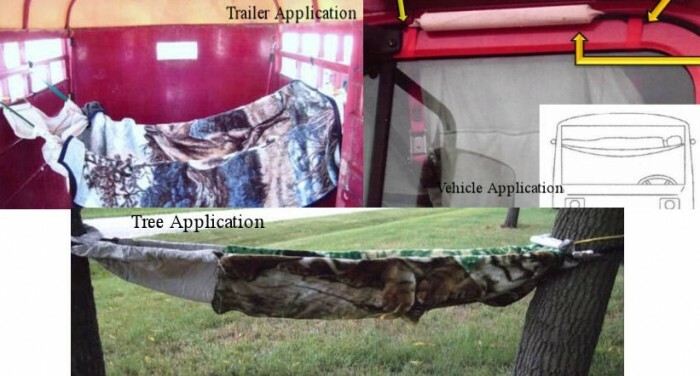 Store the Nap-Sac in your car or truck and you’ll always be prepared if you find yourself stranded on the highway. You can stay warm, dry and comfortable until help arrives. Pack some additional compact survival tools for emergency situations and you are set for almost anything! Our Nap-Sac is constructed to support up to 300 lbs. (XL versions available as well to support over 300 lbs.). 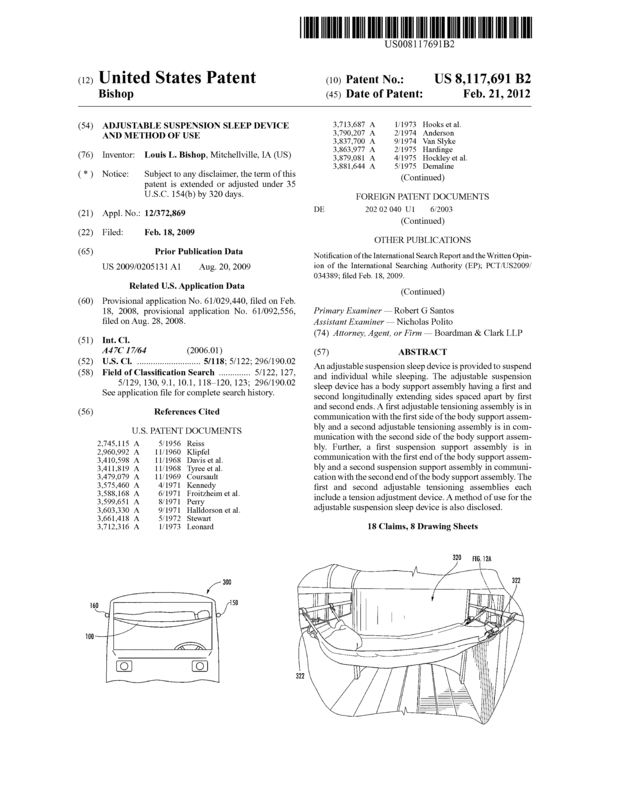 After years of time and a great deal of investments, only our Nap-Sac has been able to pass the rigorous safety testing imposed by the U.S. Patent Office. Page created at 2019-04-26 6:31:37, Patent Auction Time.